Caramelised red onion tart with goat’s cheese is a tasty recipe that can be used in a variety of ways to create a stunning looking meal that is inviting and delicious. This recipe can be made as individual tarts that look good served as a starter for a dinner party. By making individual portions it is possible to leave out ingredients that some guests may not be keen on. For example if a guest does not like goat’s cheese it is possible to replace this with small cubes of strong cheddar – or even leave out completely. Goat’s cheese has quite a strong flavour and aroma that is not to everyone’s taste. But, with this recipe it is tasty and complements the red onion. Try to choose a harder cheese rather than the more traditional soft goat’s cheese as it will then cube easily and keep its shape whilst being baked in the oven. This tart is made with a puff pastry so that it rises enough to form a box shape to hold the caramelised red onion mix. To be honest making puff pastry is both time consuming, messy and not always reliable. By purchasing ready-made puff pastry for around one pound in money you are assured of success every time without the hassle! Red onions are used in this recipe as they are less pungent that the normal onion used for cooking and because they have more visual impact on the finished presentation. If you cannot find red onions in your supermarket or prefer the normal type of onion try to find a deeper coloured cheese such as red Leicester and lay a slice of this on top of the onion mix before adding the goat’s cheese. This will add a little more colour to the finished dish. Sugar is used in this recipe to provide a caramelised consistency to the onions. Using a brown Demerara sugar gives a better flavour to the mix and also a thicker sauce. 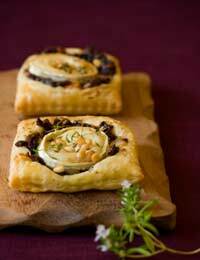 This recipe can also be used for vol au vents for parties. Use the same filling in the small bite sized pastry cases. Egg wash is a mixture of whisked egg with a little milk. Brushed over any form of pastry it will give a brown glossy glow to the baked pastry. When using egg white apply it carefully with a pastry brush making sure that any drips are wiped from the baking sheet or they will stick and burn. As you need your puff pastry to rise evenly to form a box shaped container for the onion mix ensure that the egg wash does not run down the sides of the pastry and stop it from rising. Heat half of the butter and add the onion and garlic. Cook until soft but not brown. Add the rest of the butter and heat through until bubbling. Add the sugar and simmer until the sugar sauce is sticky and thick. Remove from the heat so that it starts to cool but does not become cold and hard. Roll out the puff pastry to a form an even eight inch square. Divide into four squares if serving individual portions. Place the pastry onto a floured baking tray and run a sharp knife around the edge of the pastry case approximately one inch in, if making a large tart, and half an inch in if making individual ones. Do not let the knife cut through to the bottom of the pastry or the mix will leak through and stick. Carefully brush the egg wash over the outside rim of the pastry. Place on the middle shelf of the oven for ten minutes until the pastry has started to rise. Remove from the oven and using the back of a spoon push the centre of the pastry flat so that a box has been formed. Divide the onion mix between the pastry boxes or evenly over the larger box. Cut the goats cheese into small cubes and dot over the top of the tarts. Add a little more egg wash to the rim of the tart and place into the top of the oven so that the pastry finishes cooking and the goat’s cheese melts. Depending on your type of oven you may have to alter the temperature and cooking time. Serve as a starter or as an accompaniment to a main meal.